Just so you can indulge and relax as we beautify your nails. When we say pamper, we mean it. Your nails will never look the same again, thanks to the Chanel Le Vernis longlast nail polishes. A N20 nail spa treatment can work like magic, making your fingers look slimmer & longer. …as we beautify your nails. 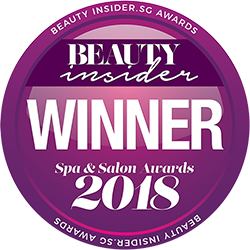 N20 Nail Spa is an award-winning nail salon, all thanks to the support of all our customers! N20 Nail Spa provides premier nail care manicure and pedicure services in Singapore. If there is anything we desire the most, it is to delight our customers and earn their smile. Nail polishing is as much an art as it is a skill. Hence, N20’s nail artists are trained manicurists and pedicurists, skilled in a variety of manicures and pedicures. Types of manicure : Tip, Glitter, Gelish, Rainbow, Glitter French & more. Types of pedicure : Paraffin Treatment, French Pedicure, Herbal Pedicure & more. To create the best possible nail art, we use only premium professional nail lacquer, namely the French and American nail polishes, brands such as Chanel, Morgan Taylor and Orly. These are longlast nail polishes, colours are vibrant, and they are resistant to chipping and smudging. As for the best possible foot therapy, customers can expect Footlogix pediceuticals in our salon. So head down to N20 Nail Spa @ Westgate Mall or VivoCity and pamper yourself with our fabulous manicures, pedicures and relaxing foot massages. As part of our Spa Package, your fingernails will be given a pampering treat. Once trimmed to the perfect shape, the cuticles and surrounding skin are hydrated to smoothen out fine lines and wrinkles, before nail polishes are applied to the cuticles. N20 uses quality long-lasting nail polishes such as Chanel Le Vernis which are resistant to chipping and smudging. Our Spa Pedi specialists are trained to rejuvenate tired feet and to restore their beautiful posture. Your feet will be given a deep herbal bath, nails trimmed, and a lush massage before a nourishing foot mask is applied. While you unwind in the comfort of our lounge, see your toe nails come to live with the works of our nail artists. You will never walk out of our salon the same ever. Our operating hours may differ on certain public holidays. Check our latest updates.